With the recent advent of inductive charging systems all major automotive manufacturers develop concepts to wirelessly charge electric vehicles. Efficient designs require virtual prototyping that accounts for electromagnetic and thermal fields. The coupled simulations can be computationally very costly. This is because of the high frequencies in the electromagnetic part. This paper derives a mixed frequency-transient model as approximation to the original problem. We propose a co-simulation such that the electromagnetic part is simulated in the frequency domain while the thermal part remains in time domain. The iteration scheme for the frequency-transient model is convergent for high frequency excitation. The error bound improves quadratically with increasing frequency. The frequency-transient model is very efficient for coupled heat-electromagnetic simulations since the time scales typically differ by several orders of magnitude. The time steps of the full system can be chosen according to the heat subsystem only. MSC: 35K05, 35Q61, 65Z05, 78A25, 78M12, 80M25. With the recent advent of inductive power charging systems and wireless power transmission in consumer and mobile phone technology, , all major automotive manufacturers develop concepts to wirelessly charge electric vehicles, both plug-in and pure electric vehicles (EV). For example the prototype from the Leopold Kostal GmbH & Co. KG of such an inductive charging station is shown in Figure 1. The necessity to charge EVs with today’s battery technology after every prolonged use - at least every night - is seen as one of the major drawbacks in the usability of EVs. A system to automate the charging process would reduce the burden on the driver; it could increase the acceptance of EVs, and, in the case of plug-in hybrid EVs, it could help to further reduce the CO 2 footprint since the battery of the plug-in hybrid could always be considered fully charged. This is important for the calculation of the fleet CO 2 emission. Prototype of an inductive charging station that charges the vehicle through its number plate (Images from Leopold Kostal GmbH & Co. KG). A future inductive charging system does not necessarily exhibit a lower efficiency than a comparable conductive charging system, since there are only a few additional components; in a simplified view, the inductive charging system could be considered as a conductive charging system that has been cut in half in the middle of the transformer. There are, however, certain aspects that require attention and detailed design and optimization. These include positioning tolerances of the stationary (‘primary’) and car-mounted (‘secondary’) coils, magnetic stray fields, and thermal aspects. The efficiency of both conductive and inductive charging systems is aimed well above 90%, measured from the primary AC connection to the drive train battery. But even with this high efficiency, at 3.5 kW of first generation systems charging power there is a non-negligible amount of heat to be dissipated. Later generations with even higher power will further increase the heat load on the components. This heat load is the result of several different processes, namely resistance losses due to DC resistance and proximity effects, ferrite core losses and switching losses in the active semiconductor switching components. The main effects appear at the same frequency range as the magnetic field, which is of the order of 10-100 kHz. The resulting temperature however changes on much slower timescales, in the order of minutes, determined by the heat capacity and the (relatively large) mass of the involved components. This electromagnetic-thermal problem is fully coupled, as many of the material parameters show a significant thermal dependence. Typical ferrite core losses, for instance, are minimal at temperatures around 90∘C and increase below and above this temperature. This drives the equilibrium temperature of the ferrite material always close to this temperature, if the dissipated power is small enough, or makes the system thermally unstable, if the heat power is too high. Engineering samples of such systems are expensive, heavy, possibly dangerous to operate, and take a lot of time to build and optimize. Virtual prototyping using efficient simulation methods accelerates this process. There are different methodologies and models available, . The paper is structured as follows: In Section 2, we propose a particular frequency-transient model for electromagnetic-thermal problems. The electromagnetic (EM) field is considered at high frequencies, where the time scale of the heat conduction is significantly lower than the time scale of the EM field. This can be exploited in the modeling. We propose a co-simulation scheme, similar to dynamic iteration , and analyze its convergence properties in Section 3. The analysis exhibits interesting results, especially for high frequencies. Possibilities to generalize this model are also discussed. Section 4 validates the results by a numerical simulation of a simplified model of the inductive charging system shown in Figure 1. In contrast to , where the different ways of co-simulation are discussed, we focus here on modeling and analysis of the frequency-transient model. In this section, we derive a model, which describes the electromagnetic field coupled to the temperature in the materials. For that, in Section 2.1 Maxwell’s equations are introduced with temperature dependent material parameters. The conduction of the heat is described in Section 2.2 by the heat equation together with an electromagnetic power term as source to describe the Joule losses of the EM field. Finally, in Section 2.3 assumptions and approximations lead to the frequency-transient model . E = − ∇ φ − ∂ A ∂ t with B = ∇ × A . ∇ × ( μ − 1 ∇ × A ) + ε ∂ 2 A ∂ t 2 + σ ( T ) ∂ A ∂ t + ε ∇ ∂ φ ∂ t + σ ( T ) ∇ φ = J src . ∇ × ( μ − 1 ∇ × A ) + ε ∂ 2 A ∂ t 2 + σ ( T ) ∂ A ∂ t = J src . The so-called curl-curl equation will be treated in the following on a finite domain with adequate boundary conditions (BC) and initial values (IV). For the low frequency range, where inductive effects dominate, usually the displacement current ∂ D / ∂ t = ˆ ω 2 ε A ˆ can be disregarded. This is called magnetoquasistatic formulation. For details on these formulations we refer to . Here we are interested in the high frequency range. Therefore our model is based on the full Maxwell formulation (1)-(4). Q ( A , T ) = J ⋅ E = σ ( T ) E ⋅ E + J src ⋅ E = σ ( T ) ∂ A ∂ t ⋅ ∂ A ∂ t − J src ⋅ ∂ A ∂ t .
The power term is further simplified in the next section. Now we aim at a model which allows an efficient simulation. The model consisting of (5) and (6) with (7) is defined in the time domain. A multirate co-simulation scheme could simulate both equations with different time steps. However, for a fast varying source current density the main part of the computational costs is caused by the simulation of (5). A discussion of single-rate and multirate schemes can be found in . We will reduce these costs further by refining the model. T ˜ i : = 1 τ i + 1 − τ i ∫ τ i τ i + 1 T ( t ) d t .
∇ × ( μ − 1 ∇ × A ) + ε ∂ 2 A ∂ t 2 + σ ( T ˜ i ) ∂ A ∂ t = J src . where the complex phasor A ˆ c is the solution for J ˆ src . This means the amplitude is constant within the time interval [ τ i , τ i + 1 ] . Let us look at (7) again, but now with the approximation σ ( T ( t ) ) ≈ σ ( T ˜ i ) . The dot product is the usual real inner product. ρ c ∂ T ∂ t = ∇ ⋅ ( k ∇ T ) + Q ˜ i . The curl-curl equation is formulated with constant material parameters in frequency domain. Thus, only a linear, complex system has to be solved once for each time window, instead for each time step of the curl-curl equation in time domain. We will now discuss the algorithm to simulate heat-EM problems with the frequency-transient model. After discretization, the model is solved in a Gauss-Seidel scheme, which can be interpreted as co-simulation. It is comparable with a dynamic iteration for time integration. Section 3.1 will briefly discuss the co-simulation scheme. In Section 3.2 the convergence analysis for the iteration is proved. where ∘ denotes the Hadamard (element wise) product, diagonal positive definite matrices for thermal conductivity and volumetric heat capacity M k , M ρ c , discrete divergence and gradient operators S ˜ , − S ˜ ⊤ on the dual grid, respectively. The matrix P ∈ R n × 3 n averages and sums up the discrete losses, cf. (12). We use P : = [ I , I , I ] with I ∈ R n × n being the identity matrix. However other choices are possible and in  a more sophisticated averaging is proposed for P.
To simulate this model, (15) and (16) are solved successively. This can be repeated for one time step until convergence (see Algorithm 1), similarly as done in Gauss-Seidel schemes. Here, we call it co-simulation. The scheme is also depicted in Figure 2. However, since convergence cannot be guaranteed for such schemes in general, a proof is given in Section 3.2. From Algorithm 1 it can be seen that time steps are chosen according to the time constant of the heat equation and only one (complex) linear system is solved per iteration for the curl-curl equation in frequency domain. Thus the time step size is independent of the excitation frequency ω. In contrast, a time domain solution would require many time steps per period 2 π / ω and consequently the solution of a large number of real-valued linear systems. This is the reason, why the model is very efficient for high frequencies since there is multirate behavior. for some frequency dependent upper bound C 0 ( ω ) that is independent of the temperature. X : = ω 2 M ε − C ⊤ M ν C , Z : = − X + j ω M σ .
where X 1 / 2 : = U Σ 1 / 2 U − 1 for an eigendecomposition X = U Σ U − 1 . The Lemma guarantees solvability of Maxwell’s equations independent of the temperature. However, generalizations are possible but we focus here on the high frequency case because it exhibits a distinct multirate potential. In practice the time-harmonic approach can be used over a wide range of possible excitation frequencies. In particular for low-frequencies where the displacement currents are often disregarded [13, 14]. Furthermore for other choices of gauging similar results are found. Also in pure transient simulation , a wide range of excitation frequencies is covered in practice. where C ( ω ) is uniformly bounded. Furthermore, we have C ( ω ) = O ( 1 ω 2 ) for sufficiently large ω. ( M ρ c + h i N ) ( T l + 1 − T ∞ ) = h i ω 2 2 P ( M σ l + 1 a ⏜ l + 1 ∘ a ⏜ l + 1 ¯ − M σ ∞ a ⏜ ∞ ∘ a ⏜ ∞ ¯ ) + h i ω 2 P Im ( j ⏜ ⏜ s ∘ ( a ⏜ l + 1 − a ⏜ ∞ ) ¯ ) . ( M ρ c + h i N ) ( T l + 1 − T ∞ ) = h i ω 2 2 P ( M σ l + 1 − M σ ∞ ) ( a ⏜ l + 1 ∘ a ⏜ l + 1 ¯ ) + h i ω 2 2 P M σ ∞ ( a ⏜ l + 1 ∘ a ⏜ l + 1 ¯ − a ⏜ ∞ ∘ a ⏜ ∞ ¯ ) + h i ω 2 P Im ( j ⏜ ⏜ s ∘ ( a ⏜ l + 1 − a ⏜ ∞ ) ¯ ) . ( M σ l + 1 − M σ ∞ ) ( a ⏜ l + 1 ∘ a ⏜ l + 1 ¯ ) . a ⏜ k l + 1 ( σ k ( T k l + 1 ) − σ k ( T k ∞ ) ) a ⏜ k l + 1 ¯ . ∥ T l + 1 − T ∞ ∥ ≤ ∥ M ρ c − 1 ∥ ⋅ [ h i ω 2 2 ∥ P M σ ∞ ( a ⏜ l + 1 ∘ a ⏜ l + 1 ¯ − a ⏜ ∞ ∘ a ⏜ ∞ ¯ ) ∥ + h i ω 2 ∥ P Im ( j ⏜ ⏜ s ∘ ( a ⏜ l + 1 − a ⏜ ∞ ) ¯ ) ∥ ] . Now, we need estimates for (a) the linear term ∥ a ⏜ l + 1 − a ⏜ ∞ ∥ and (b) the quadratic term ∥ a ⏜ l + 1 ∘ a ⏜ l + 1 ¯ − a ⏜ ∞ ∘ a ⏜ ∞ ¯ ∥ . where we have exploited the Lemma to obtain c ( ω ) : = C 0 2 ( ω ) ω | σ max ′ | ∥ j ⏜ ⏜ s ∥ . ∥ a ⏜ l + 1 ∘ a ⏜ l + 1 ¯ − a ⏜ ∞ ∘ a ⏜ ∞ ¯ ∥ = ∥ ( a ⏜ l + 1 − a ⏜ ∞ + a ⏜ ∞ ) ∘ ( a ⏜ l + 1 − a ⏜ ∞ + a ⏜ ∞ ) ¯ − a ⏜ ∞ ∘ a ⏜ ∞ ¯ ∥ ≤ ∥ ( a ⏜ l + 1 − a ⏜ ∞ ) ∘ ( a ⏜ l + 1 − a ⏜ ∞ ) ¯ ∥ + 2 ∥ ( a ⏜ l + 1 − a ⏜ ∞ ) ∘ a ⏜ ∞ ∥ . ∥ a ⏜ ∞ ∥ = ∥ ( Z ∞ ) − 1 j ⏜ ⏜ s ∥ ≤ C 0 ( ω ) ∥ j ⏜ ⏜ s ∥ . ∥ T l + 1 − T ∞ ∥ ≤ h i ω 2 c ( ω ) ∥ P ∥ ∥ M ρ c − 1 ∥ ∥ T l − T ∞ ∥ ( ω c ( ω ) ∥ M σ ∞ ∥ ∥ T l − T ∞ ∥ + 2 ω C 0 ( ω ) ∥ j ⏜ ⏜ s ∥ ∥ M σ ∞ ∥ + ∥ j ⏜ ⏜ s ∥ ) . c ( ω ) = C 0 2 ( ω ) ω | σ max ′ | ∥ j ⏜ ⏜ s ∥ ∼ 1 ω 3 . Mimetic discretizations of Maxwell’s equations (e.g. by FIT) use a primal and dual grid. 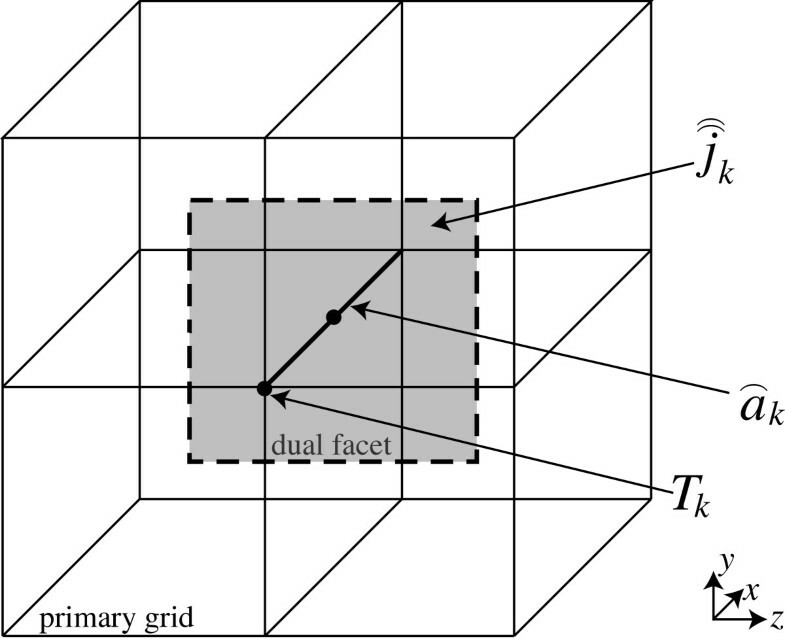 The discrete temperatures T k are located at primary nodes, the line-integrated electric field and the magnetic vector potentials e ⏜ k = a ⏜ k ′ are defined at primary edges and finally the facet-integrated source current density j ⏜ ⏜ k at dual surfaces. The material laws relate the quantities on both grids, e.g., the conductivity connects by Ohm’s Law the currents and voltages, i.e. j ⏜ ⏜ k = σ k ( T k ) e ⏜ k . The figure shows the case for a current in x-direction. The frequency-transient model can be generalized in different ways. To enhance versatility, one can use a multi-frequency excitation of the EM subsystem. An application would be steel hardening of gears [16, 17], where two frequencies are necessary to obtain a homogeneous heating of the surface. Also to approximate periodic signals other than sinusoidal, multi-frequency excitation can be used. This also allows for a Harmonic Balance approach, which enables usage of a nonlinear permeability μ. A ( t ) = 1 2 ( A ˆ c ( T ) e j ω t + A ˆ c ( T ) ¯ e − j ω t ) = Re ( A ˆ c ( T ) e j ω t ) . which is now a second order PDE with partial derivatives with respect to time as well. Note that in  magnetoquasistatic formulation is used, so there the modification yields a first order system. However, since now both parts (EM and heat) have to be time integrated, the co-simulation of these can be called dynamic iteration . Q ˜ ( T ) = ω 2 2 σ ( T ) ∥ A ˆ c ∥ c 2 + ω 2 [ 2 σ Im ( ∂ A ˆ c ∂ t ⋅ A ˆ c ¯ ) + Im ( J ˆ src ⋅ A ˆ c ¯ ) ] + 1 2 [ ∥ ∂ A ˆ c ∂ t ∥ c 2 + Re ( J ˆ src ¯ ⋅ ∂ A ˆ c ∂ t ) ] . The convergence analysis can be extended accordingly. The Multirate Partial Differential Algebraic Equations (MPDAE) approach in  offers another type of generalization. It yields a fully time-domain model that introduces two time scales according to a fast and a slow component in the solution. For circuit simulation this can be exploited to efficiently determine envelope simulation in case of amplitude modulation. The method however also works for frequency modulation problems. For the coupled electromagnetics-heat problem the slow time scale comes from the heat equation, the fast time scale comes from the periodic source in the electromagnetic problem. In this section the frequency-transient model is applied to an inductive charging system for electric vehicles. The charging system is modeled in a 2d-axisymmetric way by a primary coil for the station and a secondary coil as receiver in the car. Both coils include ferrite. Additionally there is a steel slice to model the part of the car body behind the secondary coil. The electric conductivity of this steel slice depends on the temperature, i.e., the system is mutually coupled. The geometry and simulation results are shown in Figure 4. For more details of the set up we refer to . Model for an inductive charging system for electric vehicles (Comsol). A constant conductivity would have lead to a single way coupled system and thus the magnetic vector potential would by a constant vector phasor. Models with a constant conductivity (according to the initial temperature) will systematically underestimate the heating. In this case the obtained maximum temperature would be 7 K below the corresponding solution of the mutually coupled problem, . For mutually coupled problems the frequency-transient model has proved to be very efficient. This is expected, since the main part of the computational effort - the time integration of the EM subsystem - is avoided. In this numerical example ω was chosen to be 2 ⋅ π ⋅ 10 kHz . In fact the proposed co-simulation algorithm reached the end time of t end = 20 min by using only 17 time steps with n ≤ 14 iterations (on average n ¯ ≈ 5.4 iterations). This coarse time grid sufficiently resolves the dynamics of the heat equation. For comparison, in a naive monolithic simulation with 10 time steps per period 120 million time steps would be necessary to resolve the dynamics of the EM subsystems. This underlines the computational gain. 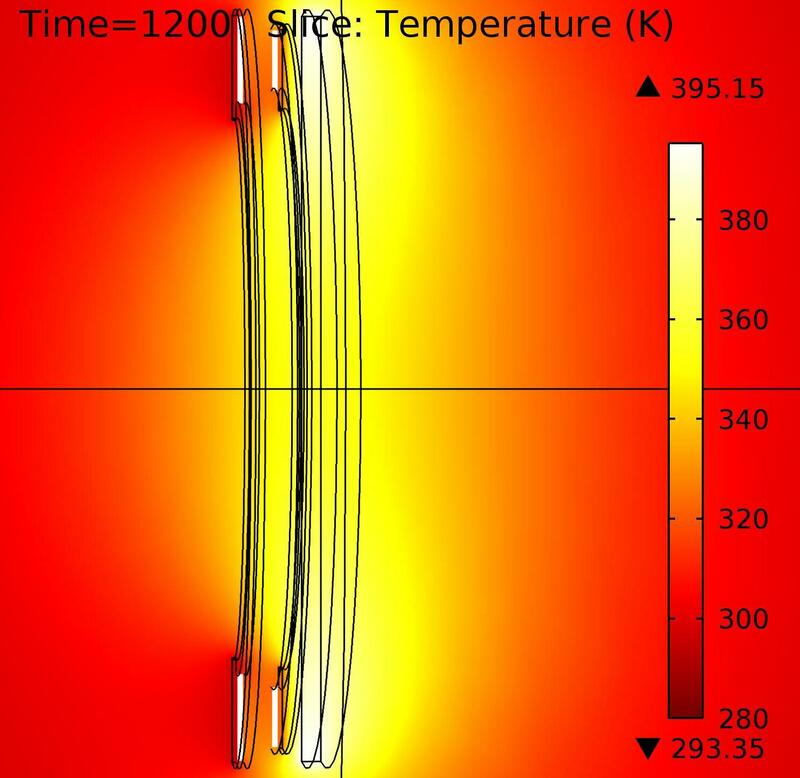 A frequency-transient model tailored for heat-electromagnetic problems was derived. The time step size of the coupled system is determined by the heat subsystem only. The convergence analysis is presented in detail. Convergence for high frequencies is guaranteed. The error bound for the iteration decreases quadratically with higher frequencies. This result also applies to approaches by Driesen and Hameyer  and similar implementations in Comsol . Thus the approach fits perfectly for applications where inductive heating either appears as losses or is intended. This work is supported by the German BMBF in the context of the SOFA project (grant number 03MS648E). The sixth author is supported by the ‘Excellence Initiative’ of the German Federal and State Governments and the Graduate School of Computational Engineering at Technische Universität Darmstadt. All authors contributed to this paper as a whole. However, special merits go to DK and MR for sharing their experiences from industry, which led to the numerical example and introduction; to SS and MG for the work on the model; to CK, JtM and MK for their contribution to the analysis. All authors read and approved the final manuscript.